Statements from two ECB officials put some downwards pressure on the euro. Both Villeory and Constâncio voiced concerns over the euro’s rally, saying that it’s a source of uncertainty given that this movement goes against the fundamentals. Constâncio added that the ECB’s monetary policy could remain loose for the long term. The upswing to 1.2288 was brought about by the Bank of Canada. The central bank increased its key rate by 25 base points to 1.25%. Governor Steven Poloz said that the banks decisions depend on current economic decisions. After this news, the euro slipped to 1.2165 (-123 pips). The main target was reached very quickly. 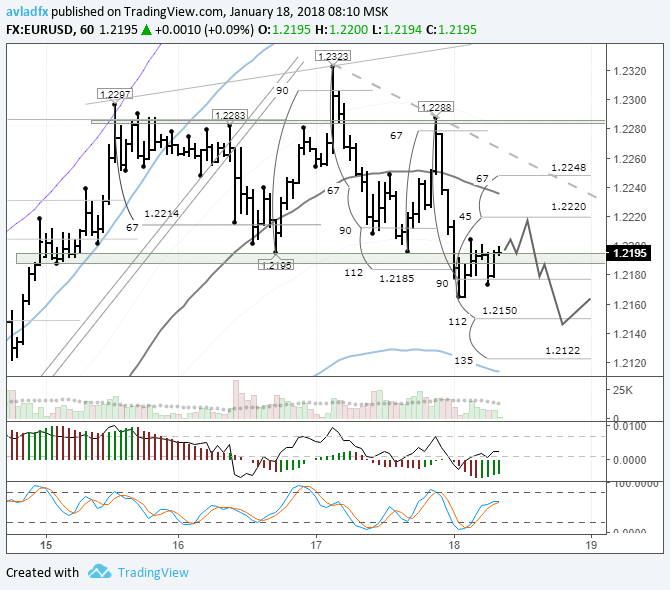 The pair dropped without hindrance to 1.2196, followed by an upwards rebound to 1.2288 and the beginning of a head & shoulders model. I don’t think this model will complete its formation today though, as I’m not expecting the price to reverse once the neckline is broken through. In Asia, the euro is trading above 1.22. The range of 1.2188 – 1.2195 that I’ve highlighted has already lost its relevance. So, what can we expect today? Hourly cycles are signalling a continued decline for the euro. The daily candlestick for 17/01/18 is also suggestive of a declining euro. Moreover, it has both a long body and wick. The euro’s decline stopped at the 90th degree despite the reversal zone being between the 112th and 135th degrees. The trend line extended from 1.2323 runs through 1.2248, where the 67th degree currently sits. My forecast is expecting a drop to the 45th degree, but we could see the trend line being tested. How can one enter the market given the current situation? To keep risk to a minimum, I’d look at selling from the 45th and 67th degrees with a stop level above 1.2300, so that the overall risk doesn’t exceed your calculated risk. You could place a stop level above 1.2323, but by increasing the stop, the lot will decrease. The likelihood of the stop will decrease, but so will the level of profit should there be a positive outcome.